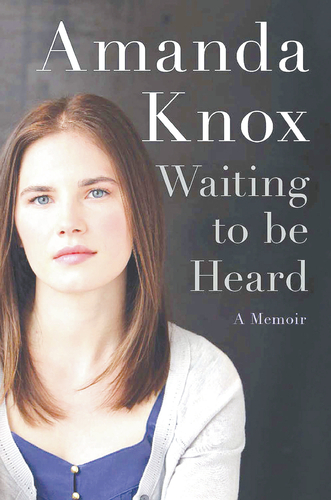 I just finished reading Waiting to Be Heard, and I am in love with Amanda Knox. Why? Because she is me—and the daughter I never had. We were both students abroad. She was 19 in Perugia, Italy, and I was 21 in Dijon, France. It may have been different decades and different countries, but we were kindred spirits. I too fell in love in the first week with a boy from a different culture. I too imagined delicious possibilities unfolding on foreign soil, and lived momentarily in a perfect paradise of romantic indecision. Raffaele looked at me seriously, appreciatively. ‘Will you be my girlfriend?’ ‘Yes,’ I said, feeling a tiny twinge that I took to be a warning sign. We’d known each other for three days. This is moving too fast. Is Raffaele making too much of our relationship too soon? It was like that for me too. My new Arab-French boyfriend and I kissed and cuddled constantly, publicly, just like Amanda and Raffaele, caught in the cameras the morning after the murder of Meredith Kercher. Fast-forward thirteen years, and the similarities continue. I too got caught up in an Italian institution I didn’t understand. 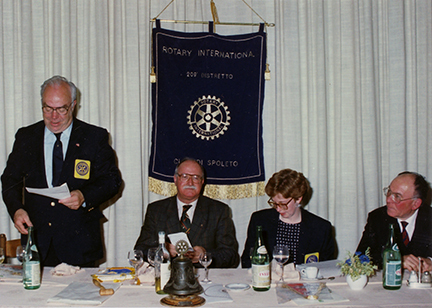 I was 35 when I was accepted into Rotary International’s Group Study Exchange Program, and spent five weeks hustling around central Italy with a group of Rotarian businessmen. Like Amanda, I too still had the confidence of youth. Like Amanda, I had had only a few days of language study when the adventure began, and I thought I understood more than I did. I became the one in the group who confidently translated, “They say the will pick us up at 10 o’clock”, and then, when they came at 8 a.m., received the anger of all, hosts and group alike. Also like Amanda, I was ignorant of the formality of Italian culture or its firmly-assigned gender roles. I didn’t know I was expected to fare bella figura—to take pride in making a good first impression. My no-wrinkle knits and sensible walking shoes failed to meet Italian expectations of women’s fashions, and my insistence that we adhere to a schedule of factory tours when asked if “we girls wouldn’t prefer to go shopping” branded me as obscenely ambitious. “If my wife were like her, I wouldn’t need to work,” I overheard one Rotarian whisper to another. Amanda and I both cemented doubts about ourselves due to our lack of cultural competency. And finally, Amanda and I both learned the hard way how quickly sleep deprivation can unravel a person. Sitting in that airless interrogation room in the questura, surrounded by people shouting at me during forty-three hours of questioning over five days, I got to the point, in the middle of the night, where I was no longer sure what the truth was…. They took me to a state where I was so fatigued and stressed that I started to wonder if I had witnessed Meredith’s murder and just didn’t remember it. It happened to be a holiday weekend for our group too, and for the first time there was no scheduled activity. We had been on the go for five days from six in the morning until the wee hours of the night, a whirl of factory tours, banquets, tourism, more banquets, and discos. That morning I went for a walk. I stumbled on a site of pre-Christian culture, then a museum, through which I trekked hoping to find more about the pre-Christians, but found only medieval torture instruments. I braved streets full of holiday revelers wielding violent souvenirs, toy whips and maces, to rejoin the group for an afternoon with a Rotarian family. But I kept starting to cry, unable to explain why. Finally a kind family member drove me back to the hotel. There I went to bed. In howling waves the visions swept over me. I saw death, over and over from the dawn of time and far into the future. I was a medieval witch, watching my coven murdered in the town square. I was Princess Leia standing on the bridge of the starship, watching my planet explode. The sorrow I felt was unendurable, the loss of hope. I cried and howled, muffling my voice with my pillow. And then the wave would pass, and I would watch TV for half and hour, some music video channel with hyperactive imagery as sexual and violent as the torture museum or the whip-carrying revelers. Then another wave would crest over me and I’d be screaming into the pillow again. If anyone had been trying to extract a false memory from me at that moment, it would have been as easy as plucking an eyelash. At the time I thought I was going mad; only later did I realize that lack of sleep was the likely cause of my breakdown. I never told my Rotarian comrades the full extent of that nightmare, but my breakdown at the family celebration was enough to seal my fate. I spent the next four weeks trying to get along with people who didn’t like me. Like Amanda, I had to deal with the consequences of my inappropriate behavior. But for Amanda the consequences were much, much, worse. I confess I have been an Amanda junkie from that day in late 2009 when the murder in Perugia hit the news. I have often wished I could tell her to forgive herself, to realize that much more was going on than she could possibly understand. But what really makes me feel that Amanda is my kin is our shared ambition. From childhood on, we both wanted to become writers. We both sensed that first, we needed experiences to write about, and set out boldly to find them. I did become a writer, and so did Amanda. Waiting to Be Heard is well written. Turning the last page, I felt like a proud parent. My Amanda did it! I take it back. I am not in love with Amanda Knox. I just want to be in her writing group. This entry was posted in Book review, Sarah's memoir and tagged amanda knox, group study exchange, making a good first impression, perugia italy. Bookmark the permalink. You are my daughter and I am a proud mother, Amanda would love you too. A older sister or wise auntie. btw, you nailed “it.” Thanks! While that was very well written unfortunately your understanding of Amanda Knox and what she did is inaccurate. This is not uncommon since the media reporting on this has been horrendous. If you are interested in understand why Amanda Knox is back on trial and why she will likely be returning to prison soon I suggest you research the evidence. Knowing the truth will make you feel better even if it is disappointing.